Will it be triumph 😄🤜🏻🤛🏻 or tears 😢👎🏻? Will you be changing your shopping habits, or are these simply careless whispers in the retail sector? 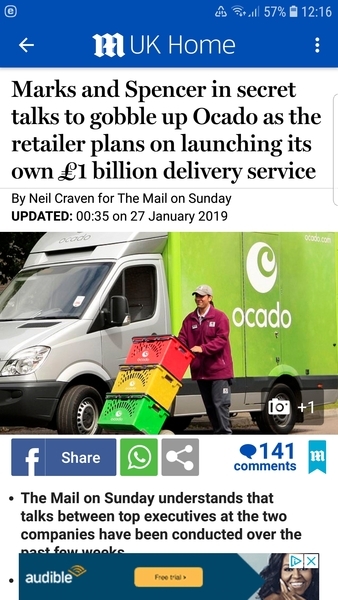 I, for one, would be pleased to see M&S venture into the home delivery sector but that means Ocado giving Waitrose the boot in 2020 when their contract ends. It's very much a dog fight on the high street at the moment, with Tesco proposing the shutdown of their in-store bakeries, fish and meat counters across more than 700 of their largest stores...subject to discussion with staff. It's all change, but is it change for the better? Not actually very secret those talks, are they? I would be delighted if M & S had home food delivery. I only drink M&S jars of coffee and I would love to have those delivered because once I stop driving it will be difficult to take these home on the bus. I think they would make a mint provided they did not charge too much to deliver. Are you seeing a resurgence of the small, local shops now then? Supermarkets feeling the pinch? Who would've thunk it? Local shops are fighting back. I can get fish, meat and baked goods locally in paper bags (waxed, compostable ones for meat and fish) and loose vegetables, again in paper bags. This is a big plus for me, and many others I think. Supermarkets equal everything in plastic. Tesco is on a downward trend. They closed online ordering (apart from groceries) a while ago. I have just begun to use online delivery before Christmas when I could not walk far..not even a supermarket aisle. I use supermarkets for store cupboard stuff but use local butcher, fish shop deli and greengrocer for fresh. All arrives in the lorry now I think that some retail will use the Brexit debacle to make cuts/ hike prices. Some may be justified some not! Profit is needed for business to work... but are they expecting too much of a profit? Are there other places to cut rathervthanjobs on the shop floor? Out of all the delivery services I would rate Ocado number 1 so I would welcome them tying up with M & S . I think it could be a winner! We have a cracking little fish shop in the village and the fish travels 16 miles from Peterhead, so you can't get much fresher! I wouldn't touch supermarket fish with a bargepole...you never know how old it is or where it comes from. I bought skate wings from Tesco...never again, they reeked of ammonia. I have never had a home delivery from any supermarket, unlike all 3 DDs who swear by them (and complain when the unavailable loo rolls are replaced with a box of tissues or a cucumber ). I prefer to select my own produce and am more often using farm shops, local village shops and independent retailers rather than using the Big Boys although I understand how useful home delivery is for those unable to get out to the shops.